The Daryl Evans Racing JunkYard Cross CX race has to be the largest attending event in SORCE history! 261 racers took to the much praised cyclocross course setup in collaboration with Nick and James of VCXC. With remnants of a typhoon threatening to make things miserable for us we were forced to abandon sections of the planned course through the forest. This turned into a good thing as the VCXC crew found other cool features to bank and flow making for a fabulous course filled with variety and challenge. 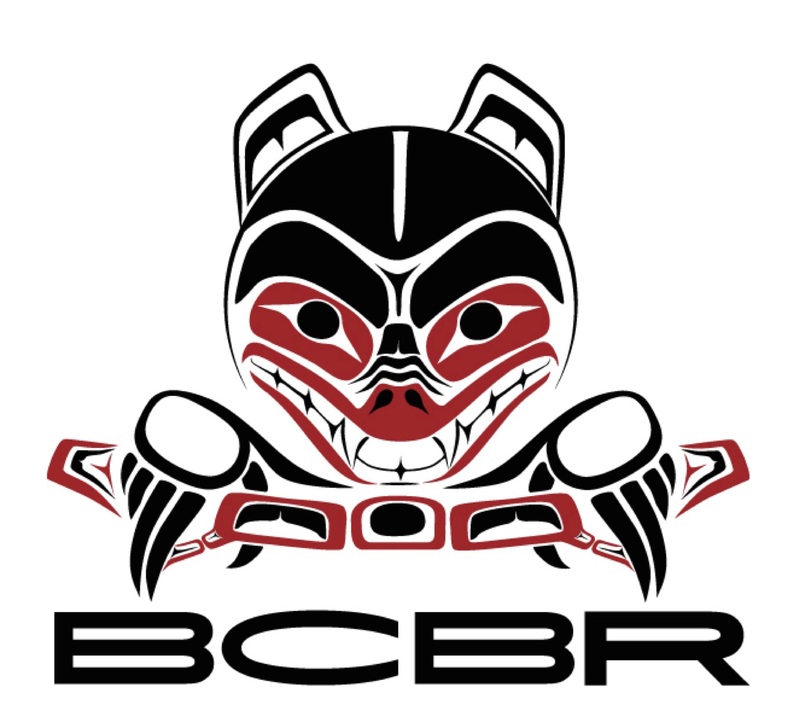 Thank you to all our excellent sponsors; Daryl Evans Racing, Central City Brewery & Distillers, South Surrey Cycles, BC Bike Race, PhysioMoves Physiotherapy and Norco Bikes. Papa Murphy's Pizza with ovens on site prepared over 350 slices for the hungry crowd. Little Big Shot provided energy drinks, Clif Bar with energy bars, and Nitrolube provided chain lube swag. We had so much swag that about 1 in 4 persons received a door prize from are many sponsors. Scott Robarts took an amazing number of photos and are copyright free for your downloading pleasure. HERE. Full results are at the VCXC site HERE. 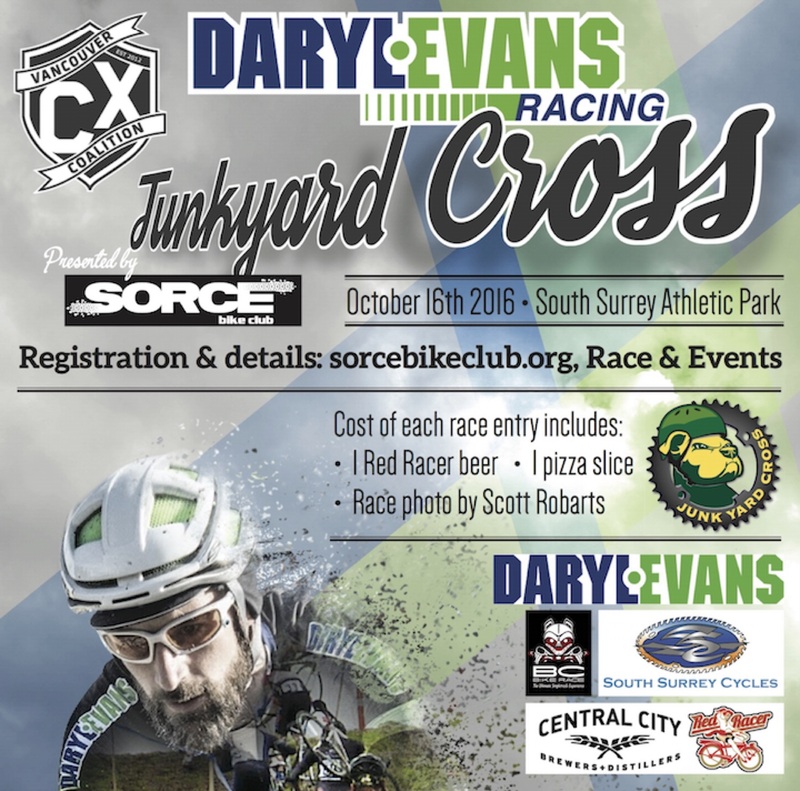 The Daryl Evans Racing JunkYard Cross CX race is ready for the 100's of CX racers that will descend on South Surrey Bike Park, October 16. 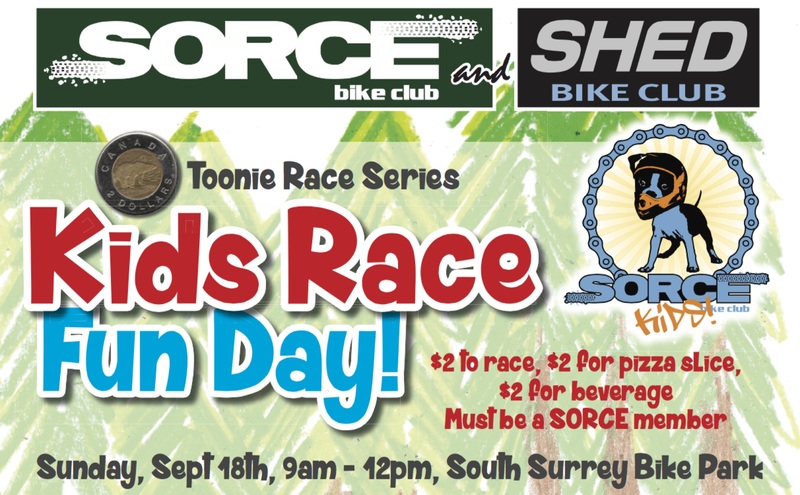 As part of the very successful Vancouver Cyclocross Coalition series, SORCE is hosting our largest event of the year. With each racer receiving a Red Racer beer at our beer garden and Papa Murphy's pizza slice, as well as more door prize swag than Santa ever brought to a race, this is BIG! 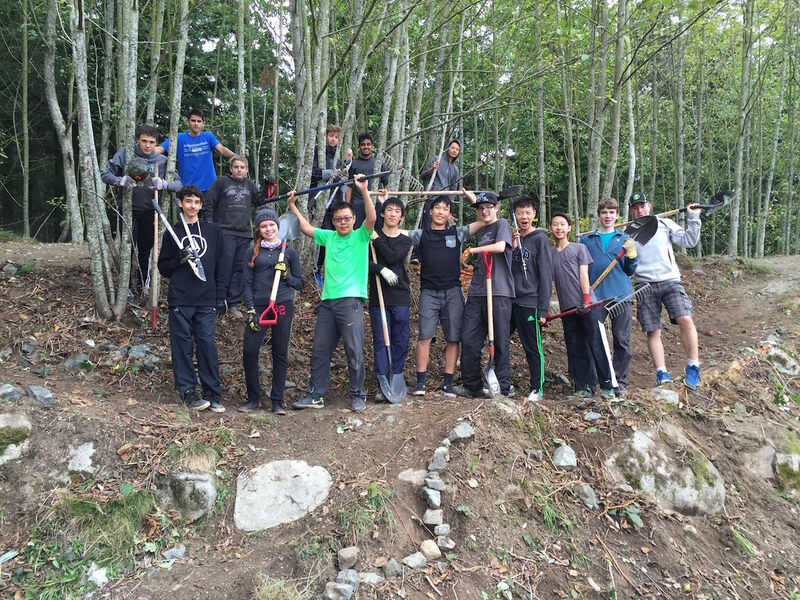 On October 4, 5 & 6, 2016, 17 grade 10 students and teachers from Southridge School volunteered about 300 man hours to clean up South Surrey Bike Park of invasive blackberry bushes, and hauled over 10 yards of special dirt to repair the berms on the flow trails. THANK YOU! The City of Surrey work crew of Derek, Dan and Brittany supplied materials, tools and guidance along with hot chocolate and Tim Bits. PS. Please do not ride those repaired spots as the dirt remains very loose and dry despite the amount of rain we have been receiving. 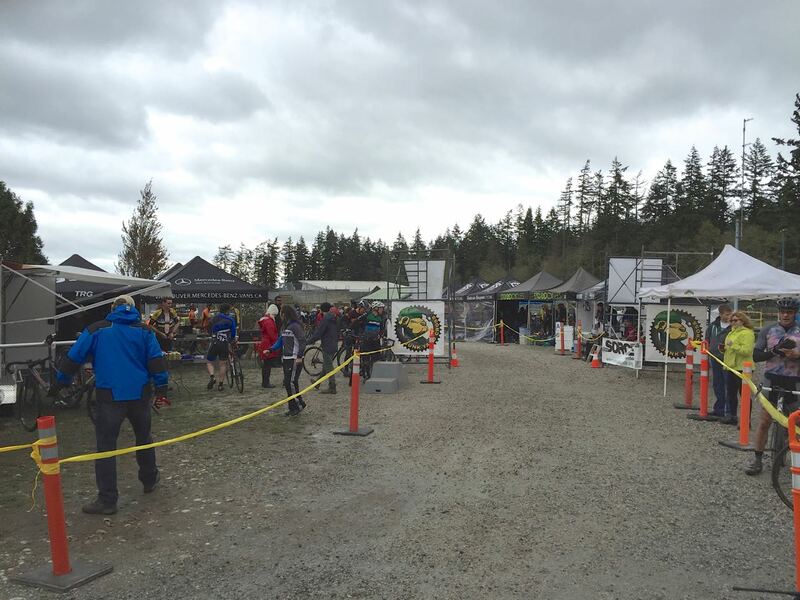 The last race of the 4 race Toonie Race series was a great day of XC racing around the JunkYard Dog Reverse course. 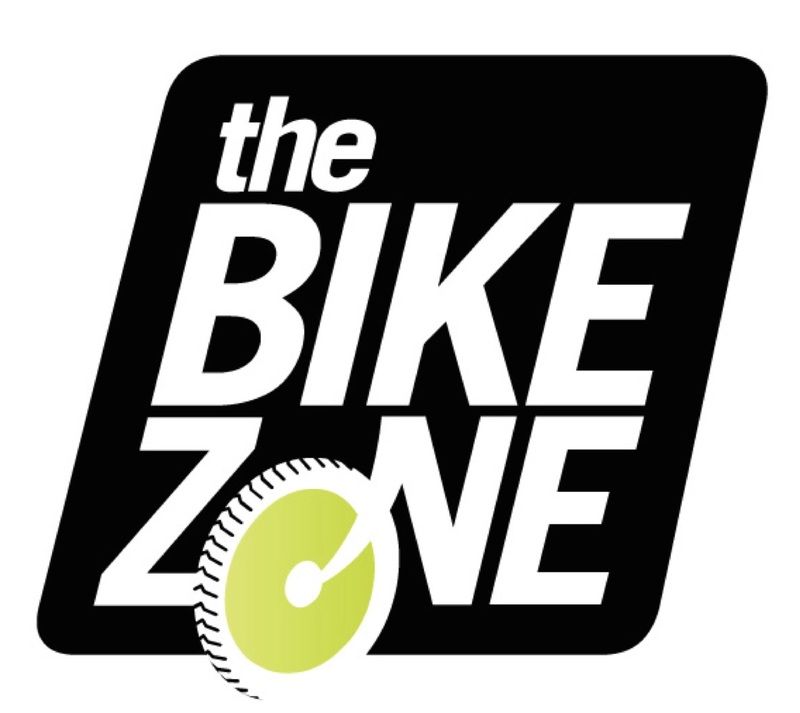 Cecil and Tom from the Bike Zone again offered great support with mechanical services, Norco bikes and riding gear to show, and some great swag! THANK YOU. The 3 lap race was won by Brad Issel, with Larry Joy and Jim Jameson in hot pursuit of the podium. Full results and lap times HERE. Photos on Flickr HERE. 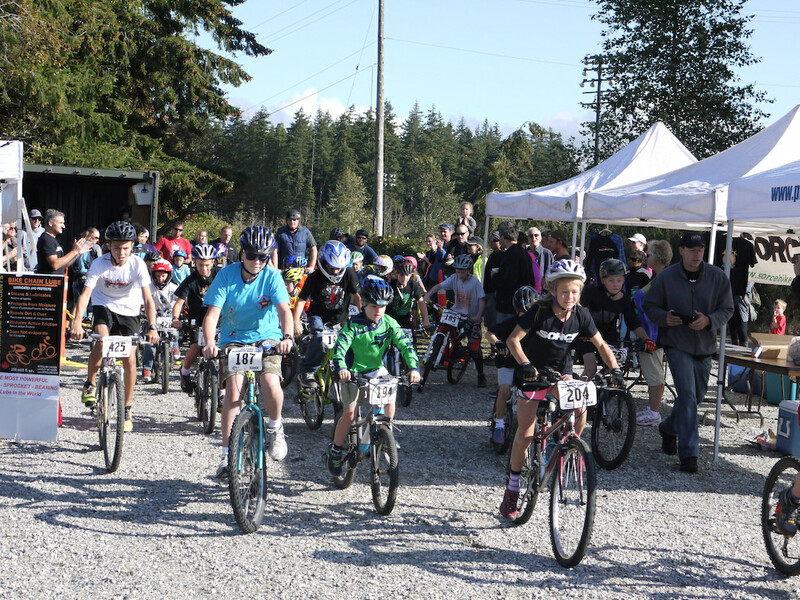 The Bike Zone Toonie #4 JunkYard Dog Reverse XC Race is this Sunday October 2. The last Toonie race of the year with the course being the JYD in reverse is a big change from the traditional JYD direction. Like a whole new trail but with all 3 pump track flow trails in the normal downhill configuration - gotta have flow!. Food, beverages and medals, with swag from BikeZone along with their tent/mechanic and Norco bikes to check out. Most fun you'll ever have for just a Toonie! See you Sunday, 9am registration with 10am start. The PhysioMoves Kids Race Fun Day was such a resounding success! 47 kids with their beaming parents descended on SSBP this morning for a great day of racing, face painting, bouncy castle fun and consumed 16 XL pizza's. Our sponsors, PhysioMoves and South Surrey Cycles provided enough swag prizes that everyone went home with cool stuff in addition to their medals. NitroLube was there with some nifty chain lube to give out. PhysioMoves provided sponsorship funding to pay for the bouncy castle. South Surrey Cycles provided a tent with mechanic and greatful morning coffee and donuts. Keep On Smiling face painting had a constant line-up. Thanks to everyone for making this day so much fun! The PhysioMoves Kids Race Fun Day is back for Sunday, Sept 18, 9am-noon. More fun than ever with BLT lap race, bouncy castle, face painting, pizza, COOL medals and prizes! PLEASE pre-register and further details HERE. Sponsored by: PhysioMoves and South Surrey Cycles. 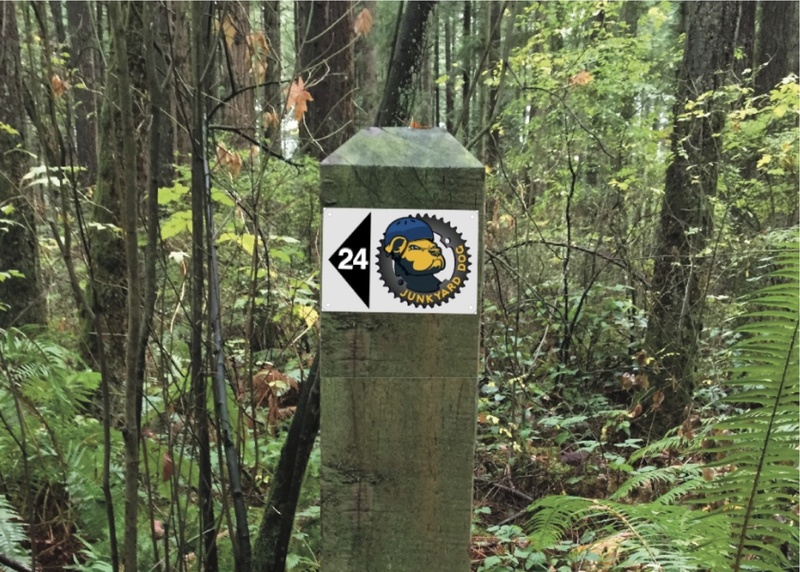 On Sunday August 7, 8am, we are having a trail day at South Surrey Bike Park to work on the JYD marker posts. As some have rotted and need replacement, along with others that need repositioning, a solid morning of post digging should suffice. Once completed we will be mounting new reflective markers, an example below. 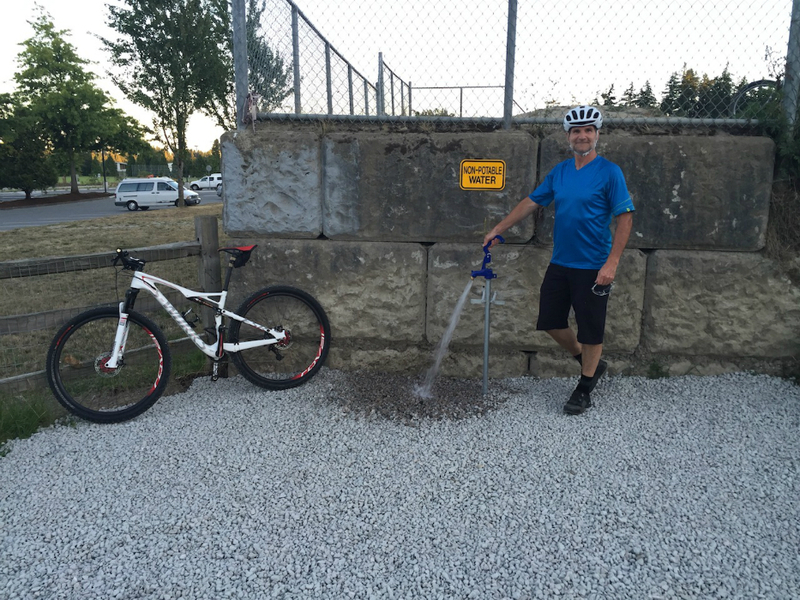 The City of Surrey installed a new water supply at SSBP. During the construction of the South Surrey Recreation Centre expansion, our supply was commandeered but not restored at the completion of the project. This has now been rectified with a new tap installed next to the picnic table. With more pressure and volume than previous, this will be an excellent source for dirt jump maintenance and as a bike wash station. 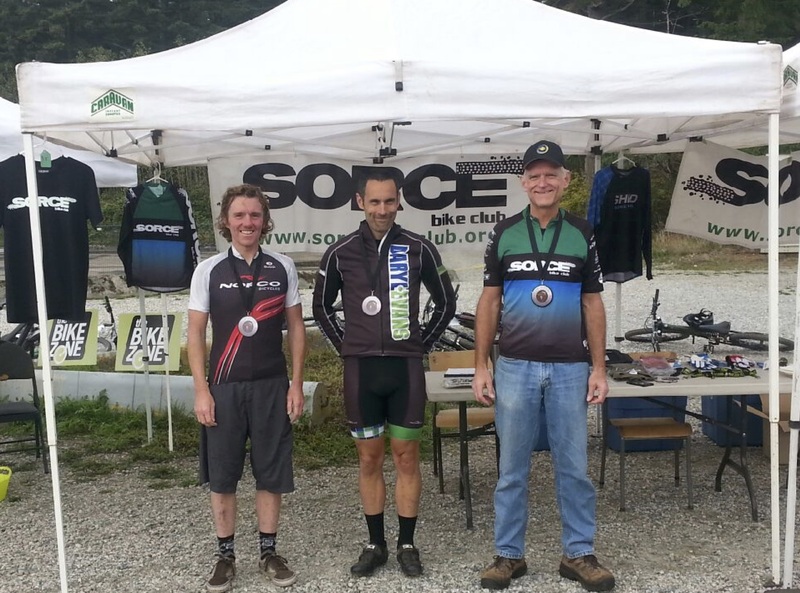 The Bike Zone Toonie Race #3 at SSBP was another fun day of ripping up the JunkYard Dog course! 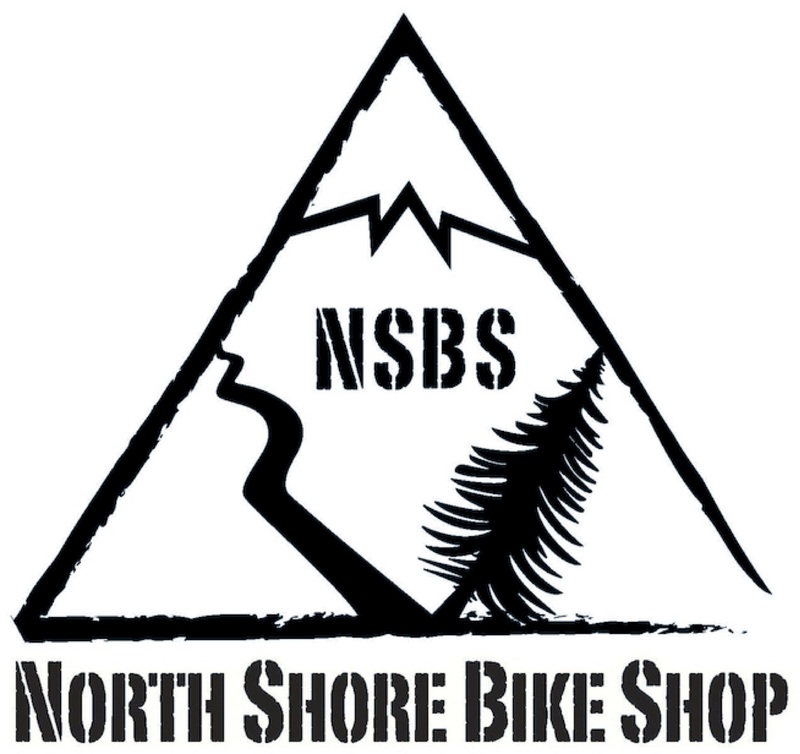 Cecil, Josh and Tom from the Bike Zone came to offer mechanical services, show off the latest Norco mtn bikes on display and provided the racers with some cool swag. THANK YOU Bike Zone! The 1 Lap group was hotly contested with Griffin Ducksworth in 1st with Javonna and brother Owen Lowe just a few seconds behind to clinch 2nd and 3rd.